And... Individuals can now license TouchRight Utilities for only $9.95! An easy interface for bringing Right Mouse functions to ANY touch screen or other pointing device interface. Great for users, developers, integrators, field service, or administrators who work with and configure non-mouse or touch screen applications. Most touch screen drivers enable a "touch" or "press" to act as the left button click of a mouse. The act of pointing is very intuitive on a touchscreen, i.e. you point! To interface with windows, the act of "touching" the screen is converted into a left click (as though you used the mouse to point to the button / area) and then "clicked" to select / press button. Since the screen IS the interface, there is no intuitive way to implement a Right-Click (No, you cannot use your other hand!). Sometimes a default press-and-hold approach creates interface issues. However, using the Right-Click can be important when working with systems, so using "TouchRight", you can easily access the system, changing back and forth from Left to Right Click! The window itself can be sized and repositioned anywhere on the screen, can be optionally hidden until needed, and provides various other capabilities as required by customers. With "TouchRight" a single touch turns your finger into a Right Click instead of a Left. Touch again, and you're back to the Left (or automatically after a single Right-Click). Always Topmost - this feature keeps the TouchRight window visible for easy access, but can be turned off when you want your screen real-estate back! 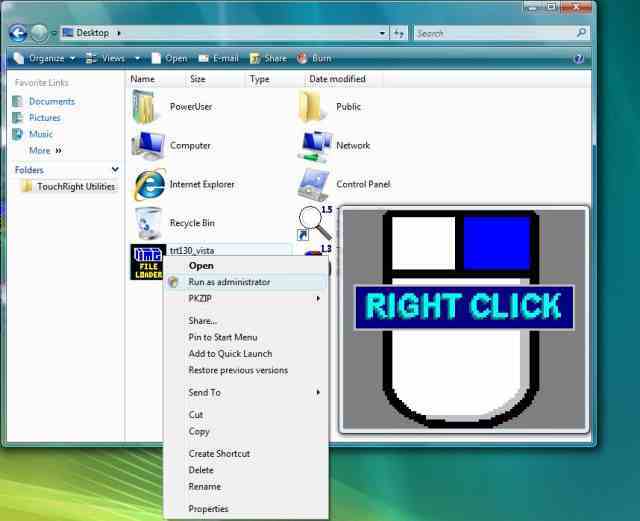 Single Right-Click Only - this option automatically returns to the default Left-Click after a single Right-Click action - great for quick "clicking"
The ability to Shutdown Windows, Exit (Logoff) Windows, and reboot your system are available. TouchRight Utilities is a standard Windows Application and does not require any special drivers, and should work with all keyboard and mouse emulation drivers that are compatible with the ones that ship with Microsoft Windows. Now... Individuals can license TouchRight Utilities for only $9.95! Download the TouchRight Utilities demo and use its Licensing Manager to purchase your license.